It’s with great pleasure that we can announce that our very own Dr Nishan Dixit is now 2018 president elect of the British Academy of Cosmetic Dentistry. The BACD is a world-leading authority on cosmetic dentistry and was formed in November 2003 by a group of dentists, many of them leading practitioners in the field of cosmetic dentistry, who saw a need to share their knowledge with others. Their aim was to create a dynamic, active group of dental professionals and an environment where everyone can come together to share their knowledge and experiences, so that everyone can become better at what they do – regardless of their level of prior knowledge. Did you know that currently any dentist can offer cosmetic dentistry irrespective of their training or experience beyond the basic dental degree. There are no specialist qualifications and no specialist register. Techniques constantly progress and the public are becoming increasingly dentally educated and discerning so it’s essential to stay up-to-date. Because of this the British Academy of Cosmetic Dentistry is the voice of cosmetic dentistry in the UK, promoting clinical excellence which is carried out in an ethical, minimally invasive way, to ensure thorough understanding of this practice for Clinicians and patients alike. Through education for dentists, dental teams and laboratory technicians, the British Academy of Cosmetic Dentistry leads the profession to higher standards of dentistry. All members are encouraged to provide their dentistry to their patients in an ethical manner, whilst maintaining high aesthetic standards so that dental health and longevity of any dental work is ensured. Thanks to advancements in modern cosmetic dental care, you can achieve a beautiful smile almost instantly; however, currently any qualified dentist can offer cosmetic dentistry and no UK postgraduate qualification is recognised in cosmetic dentistry. Finding an appropriately skilled cosmetic dentist is essential to ensure treatments are beautiful, natural looking, and successful in the long term. This is where the BACD comes in. The BACD aims to promote clinical excellence through continuing professional development, and undergoing peer review to ensure that any clinical dental work is up to the highest standards. To be listed, BACD cosmetic dentists must have shown a very high commitment to attend lectures and courses based on cosmetic dentistry. As a demonstration of their skills, members may undergo BACD Accreditation, where submitted cases are examined and evaluated to ensure that treatments are of the highest standards. 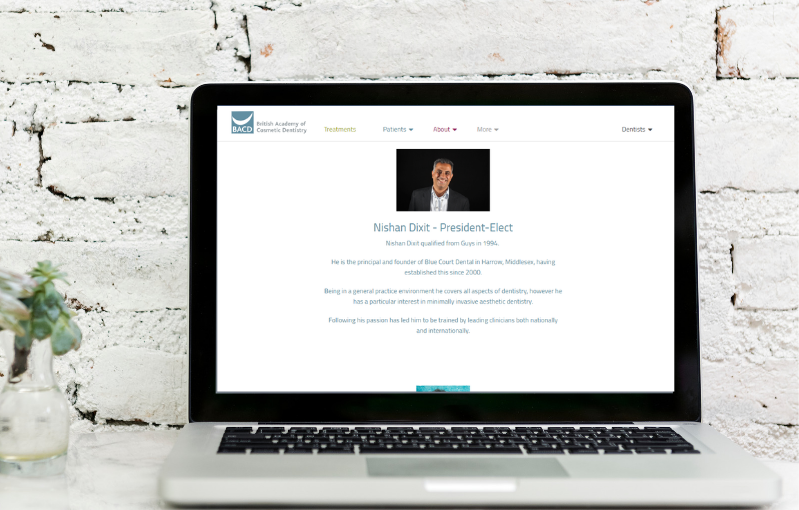 By visiting a dentist that is a member of the BACD, let alone President Elect, you can be assured that your cosmetic dentist will be working to the highest standards. This entry was posted in Practice News and tagged bacd, British Academy of cosmetic dentistry on 10 December 2018 by Dr Nishan Dixit.